The Malossi cast. Tried and true, scooterswapshop.com has them. If it’s not in stock on the website give him a call! today I got a package from Italy... a cast iron polini bbk for a kymco djx. identical engine to Hondas AF05e aero,vision, Peugeot. i didn't know kymco had a copy. i wonder if sym has one too. im really shocked at the port durations though. with no basegasket the piston is flush at tdc. at bdc, the exhaust port floor is flush to piston. transfer floors are at least 1.5mm below piston top. any one have any ideas on the path i should take with this? has anyone hve/ had this cylinder in the past? did you rock it as is out the box? or did you modify? Ive never had the Polini kit. My AF05 days only messed with the Malossi kit. My thoughts are that Polini has done their homework. Hoping that your US AF05 has the same stroke as the DJX. I would leave the timing alone and run it as-is at the beginning. Tweaks to the port windows can be made later if the bore is under performing but tough to go backwards with it. Since youre savvy with the degree wheel, Im sure youre already aware of the importance of squish and compression numbers. I dont know if your Polini kit provides a head or if the stock is used. May have to toy around with it for timing, squish and compression to all be where you want them. Have you checked out the Airsal kit? I have no experience with it but many other members have had great success. thanks meatball. yeah ive heard of the airsal kit. I plan to get one of those in the near future. I just got a metra fit and 2 polini's recently and im waiting on a mallossi kit that's in the mail. already had an italkit 46mm on one of my scoots. for now i gasket matched the cylinder and one of my jdm cases. also chamfered the ports. they were sharp out of the box. going to run it and see what i think and which way i want to go first before i grind it up. i agree, its easier to grind and take off than put back on.. lol so we shall see. also installed a ct manifold and a walbro wb carb. should be interesting. Careful with the CT’s. Notorious for slightly uneven mating surfaces out of the box. Theres a reason theyre half the cost of Naraku, Stage6, etc..also the reed petals had reports of shattering by a handful of people. Easy enough to swap out with carbon fiber one. Theyre good intakes, truly...just be aware of their reported shortcomings. Have you looked into the AF05 to AF16 gear mod? A way you can use any of the AF16 aftermarket gears available on your AF05 since the 6.8:1 Malossi gears are simply too tall. For the af05 to af16 gear swap you need an entire af16 trans. Including cover, rear axle, countershaft gear, and then your aftermarket gears. It's an expensive swap unless you have the stuff laying around or an af16 your’re willing to steal from. I know of the ct intake short comings first hand. lol. I put them on a sanding block as soon as I get them. ive never had the reeds shatter though. I do block the reed landings though. ive had sealing issues there too. I have an af18 on my shelf, will those trans parts work? either that or I can source the needed parts on buyee. one of my af05 are a 87 elite with the special gear ratio and I know where another 87 motor is for sale. but running a 90/90-10 rear tire also helps over come the gear set problem I can get to and over 50 quick and easily with a biig bore equiped af05, over range variator, dio rear pulley, and that size tire (90/90-10). has anyone looked into the ab07 gear set compatibility? I got an extra one of those on a shelf also. my kitted ab07 with an over range variator and a 90/90-10 can get to and over 50 easily also. I know they have a better gear ratio than an af05. The AF18 gears are worth a look, as I dont know of AF05 fitment. I had the 10:1 gears on mine as well and felt it could go more but the only available set is around 6.8:1 which is TOO low. I only played with an AF05 for about a year before I scored a free 16 and I met my best friend “Corsa” then the 05 was shelved and eventually sold. I never did get as far with the AF05 as you have, or plan to go. Theres a bunch of members on here that went to the moon and back with it tho....if theyre still around. Im pretty sure af18 and af05e have similar cvt parts, but not trans parts. However, I've heard that you can get the af18 gear cover machined to fit the af05e case and then you can use af18 gears. Also, I guess af05e gears fit into met/ruckus cases, so I'm wondering if there is a combo that can be made with aftermarket af05e upgears and met or ruck gears. ive actually found AF05 primary and secondary gear sets still being sold on fleebay Italy. but with a 90/90-10 rear tire and the metrakit BBK, and a OEM dio intake and carb, and dio/ gy6 overdrive variator and rear pulley I can get my tacky aero easily over 50mph. with an 87 elite gear set and/ or a bigger carb, im sure it could do 60.
the ab07 aero with the polini AF01 big bore, a dio overdrive variator, dio carb and intake, and a 3.00-10 rear tire, it has done 55 mph and would pull wheelies easily. I swapped the tire to a 90/90-10 rear and itll now cruise at 50, and top 60mph. and its not so wheelie happy. which I think is a good thing. it will pull the tire up if you make it but you really have to try. jbjhillbilly came over yesterday to sell me another 87 elite, 94 af16 dio, and a few motors. he took the blue ab07/ af01 aero for a ride. said he was surprised how fast it was. I was gonna let him try the tacky aero and just/ gyro but he had to get back home for work. I told him next time then for sure. hes ridden my gyro, but not since I put the fattys on the back. Dio or elite? If it's an American elite w an af16, it's not the same as a dio. Dios are smaller and usually have af18 motors. What part of Cali are you in? I'm in Phoenix these days, not to far from socal. From READING only, the earliest AF18s had the same 10mm crankshaft diameter as the Aero/SE 05 variated engines. You can't use the AF16 ramp plate because of that difference. The Malossi Primary gears are easy to swap, but the 7.83 gear ratio is pretty tall for the power you have, even with a 65cc top-end kit and a good pipe and carb. The Polini 47 was superior to Malossi's in my experience. Never tried Airsal. My '87 Aero, Polini equipped, also flirted with 60MPH but I never quite got there. My polini equipped 86 aero50 only hit 53 (one time) but was running stock gears. Pipe, pwk, and big reed block tho. The af18 (at least the early stuff) varios seem to fit with some boss adjustments, and I used a polini af18 belt with good results on my af05. I've heard you can machine an af18 differential cover to fit an af05 and then use dio upgears. 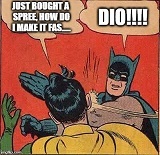 I think you can get a 9:1 set for dio, and that's a good ratio for a "10 wheel with 90/90 tire imo.